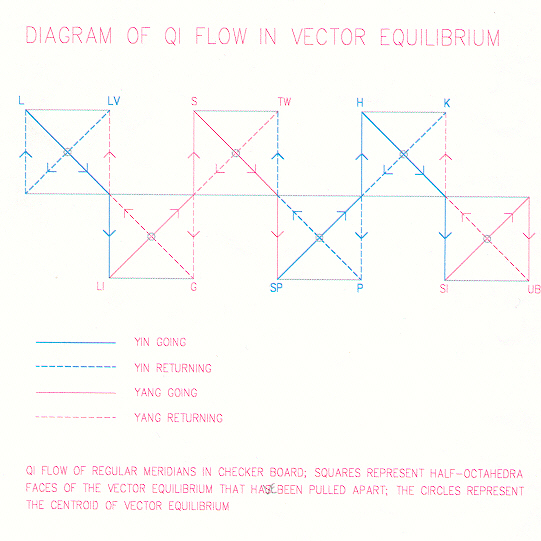 Vector Equilibrium arrayed 60 times about its center, represents a spinning (sequential primary zang-fu organ meridians) and pulsating (coupled extra-ordinary vessels) life form. Energy meridians of an organic body transport energy in order to achieve a return to singular harmonic unity. The Vector Equilibrium represents the balanced energetic body. Vectors represent the energetic meridians, and equilibrium is the balance strived for by the energy which is inherently intelligent, resilient, and desiring spiritual fulfillment (to be balanced). Vector equilibrium is a balanced destination of the spirit's devotional noble pursuit. Vector Equilibrium is the only polyhedron volume where the radial vectors and circumferential vectors, existent in its four planes, are equal in numerical quantity, hence its name. As the circumferential vectors of VE cohere to bind radial vectors, so also does the physical with the metaphysical, or regular meridians with extra-ordinary (spiritual) meridians. A balanced and strong body will support the journey of the spirit, and vice versa, a devoted spirit (inner feeling) will guide a diligent vitality (action), via a disciplined energy (thought). The quantitative equality of vectors represents the firing process required in internal alchemy, or spiritual evolution. Tetrahedral structure of the Vector Equilibrium (tetrahedral explosion eight fold in four directions). 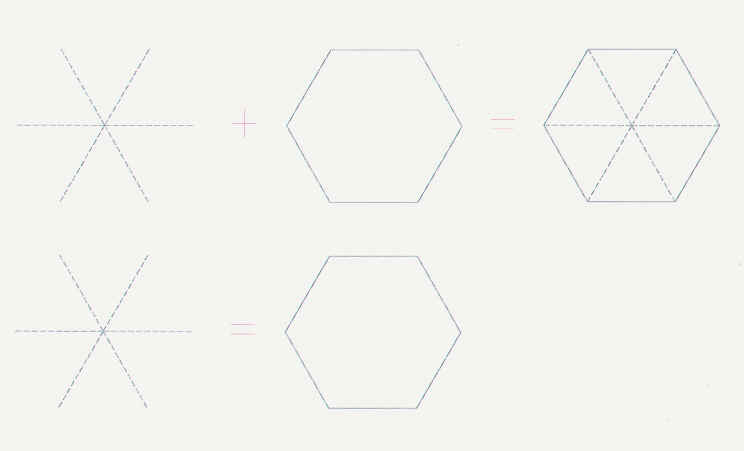 VE has a volume of 20 tetrahedra, whose volume is one. 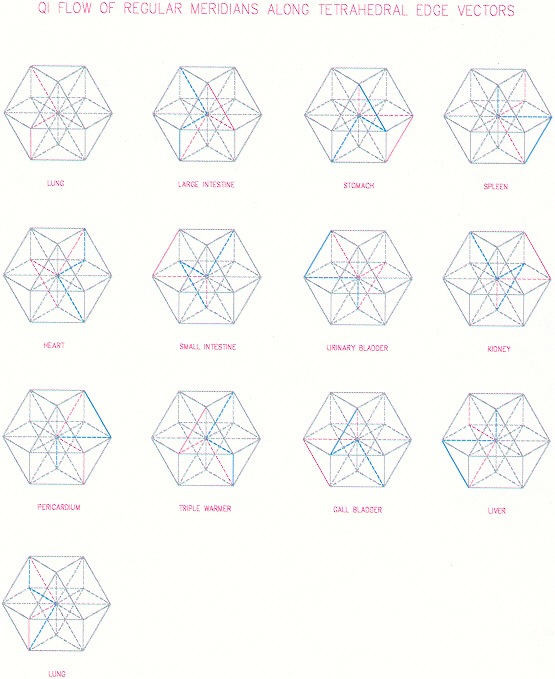 VE volume contains 6 half-octahedron volumes and 8 tetrahedron volumes. Each half-octahedron volume is equal to 2 tetrahedron volumes. The human body has 12 regular meridians and 8 spiritual meridians for a total of 20 variety meridians, the volume of the vector equilibrium when it basic building block, the tetrahedron, equals 1. The vector equilibrium (VE) is made up of 8 tetrahedron and 6 half-octahedron. Volumetrically, the tetrahedron has a volume of 1, while the half-octahedron has a volume of two. The total volume of all tetrahedra within VE is 8 (8X1). The total volume of all half-octahedron within VE is 12 (6X2); making the sum total volume of VE, 20. The mystic number of 20 links the volume of VE with the number of variety meridians in the human qi body, or meridian system. Confluent (master) points of spiritual vessels are portals in the center of the eight triangular faces of the Vector Equilibrium. These eight portals penetrate the center, mingmen-qihai, which contains yuan-source qi. Each portal is paired with its opposite via an axis (two radial vectors), creating a pulsating effect on four dimensional planes within Vector Equilibrium. 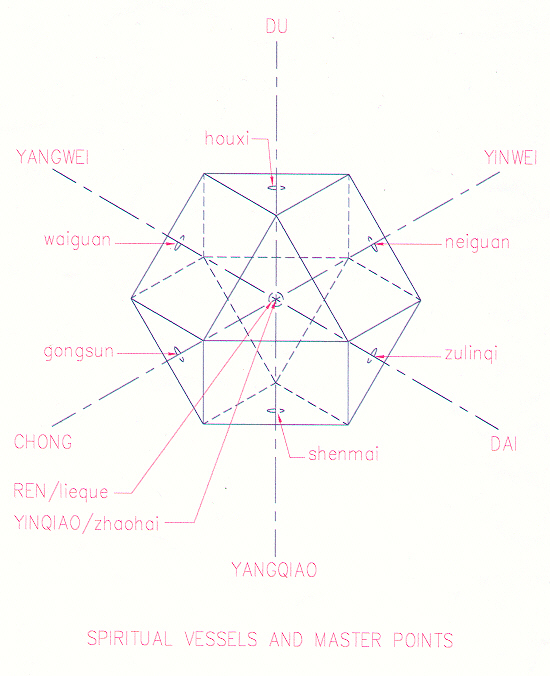 Yuan-source points of regulating meridians are portals in the center of the twelve square faces of the Vector Equilibrium. They also penetrate the center, but via the circumferential vectors. Yuan qi originates between the kidneys at GV4-ming men, the "life gate fire," which combines to warm CV6-qi hai during a contracting inhalation in reverse breathing, a mechanism to facilitate neidan, or internal alchemy. The merging of the two points happens in the region under the navel, more specifically the lower dantian, "elixir field," the centroid of the human energetic body, where internal alchemy begins and ultimately returns. Consistency in gently focusing on the lower dantian during reverse breathing for a particular length of time has been referred to as the firing process of internal alchemy which leads to spiritual refinement, or evolution. Yuan qi travels through each meridian via the triple warmer. Yuan-source points regulate yuan qi, regulate excess and deficiency syndromes of their related organs towards a homeostatic effect on the corresponding organ. Yuan-source points also retain the primordial qi of a particular organ, and therefore are portals to the mingmen, origin of yuan qi. Confluent (master) points are portals connecting regular meridians with spiritual meridians. Confluent points enhance the body and spirit by uniting regular and spiritual meridians. Confluent points and the eight spiritual vessels also represent the eight trigrams. Within the perceptual process a minimum constellation emerges from our preoccupation of getting rid of the irrelevancies. The geometry appears out of pure conceptuality. We dismiss the irrelevancies for a clear understanding, to finally arrive at the most minimum system to divide universe into macrocosm and microcosm. Tetrahedron is nature. Nature uses the tetrahedron in her fundamental formulation of organic and inorganic chemistry. Tetrahedron is the first spontaneous aggregate of our experiences. As chemists and physicists have found, nature is tetrahedrally based, and we find our thoughts resolving themselves spontaneously into the tetrahedron as we generalize about nature’s special cases. The four pointed pyramid is fire. The ‘four-star affair’ is tetrahedron. A tetrahedron has four vertex points (stars, closest packing of spheres), six vectors (edges, relationships), and four faces (openings). This form is the basic building block of all the Platonic solids. It is the most minimal thinkable set that would subdivide universe. It encloses the least volume with the most surface area. The tetrahedron is comprised of four unique planes nonparallel to one another, thus four unique perpendicular poles to establish a four dimensional system. Plato and thinkers from other ancient cultures agree that polyhedra have elemental characteristics based on their number of vertex points; the tetrahedron is the element fire, the procreative force that inspires change. The tetrahedron is the sharpest, lightest, and most penetrating of the Platonic solid group. The less vertex points a polyhedron has, the more mobile and stable it is. Western science uses the tetrahedra valency to describe molecular phases (the rate of molecular movement is regulated by heat); univalently bonded = gas; bivalently bonded = liquid; trivalently bonded = solid; quadrivalently bonded = crystal. 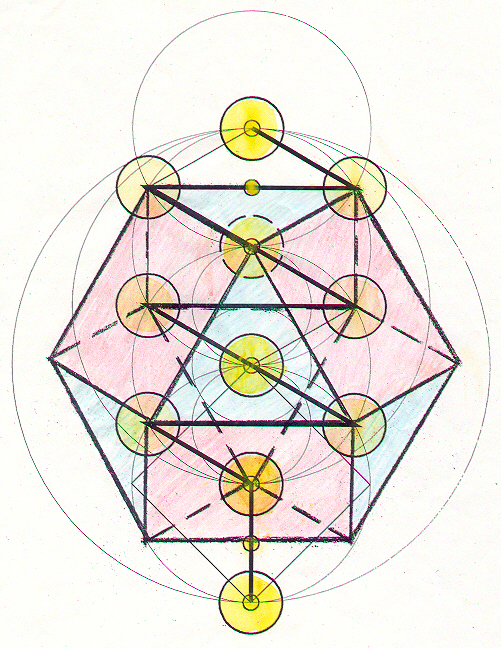 Two tetrahedrons juxtaposed at their centroids, the three dimensional star of David, or star tetrahedron as coined by DaVinci, can stabilize a cube which is the element of earth. Fire generates earth. The tetrahedron has the greatest resistance of any structure to externally applied concentrated load. However, the tetrahedron is the only polyhedron that can turn completely inside-out. When studying the progressive presence of points, or closest packing of spheres, the tetrahedron’s four vertex points represent the physical realm. The 8 tetrahedra alone support the structure of VE while simultaneously defining the 6 half-octahedra. Similarly, the spiritual meridians support the qi body by serving as reservoirs for the regular meridians. Also since the spiritual meridians follow no specific energy flow, they have been associated with the tetrahedron, since the tetrahedra apexes share VE’s centroid. This quality reconfirms the close relationship of the spiritual meridians with yuan qi, found in the lower dan tian. VE is comprised of four unique planes of tetrahedra nonparallel to one another, thus four unique perpendicular poles to establish a four dimensional system. The four planes correlate to the four married pairs of the spiritual meridians; Du-Yangqiao, Ren-Yinqiao, Dai-Yangwei, Chong-Yinwei. 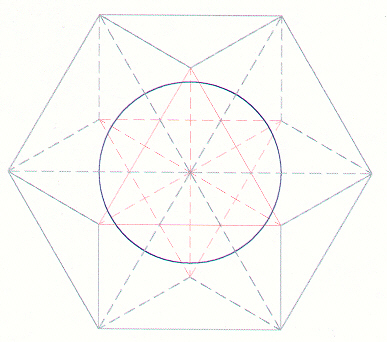 Master points may be found at the center of area of each tetrahedron base, where each polar axis penetrates. Each polar axis of a tetrahedra married pair is a highway for yuan qi. The octahedron is air. The earth generates metal, which Plato translates as air. An octahedron has six vertex points, eight faces or openings, and a volume of 4 tetrahedra. In the VE, a half-octahedra is merely the space in between 8 tetrahedra sharing a common univalency, VE centroid. Air is the jewel of life, thus the octahedron correlates to the regular meridians of the organs. Since there is a cycle of qi flow manifested by the regular meridians, their action is much different from the spiritual vessels. Regular meridian energy spins by weaving along octahedra edge vectors of VE, while spiritual meridian energy pulsates on tetrahedra polar axes of VE. Because confluent points and source points are on the same axis, they manifest a similar energetic quality, in that they have a close relationship with the jing of the centroid. The centroid of VE with the centroids of each of the closest-packed spheres which are the vertex points of vector equilibrium, make a total of 13 closest-packed spheres. These 13 closest-packed sphere correlate with the 13 ghost points. 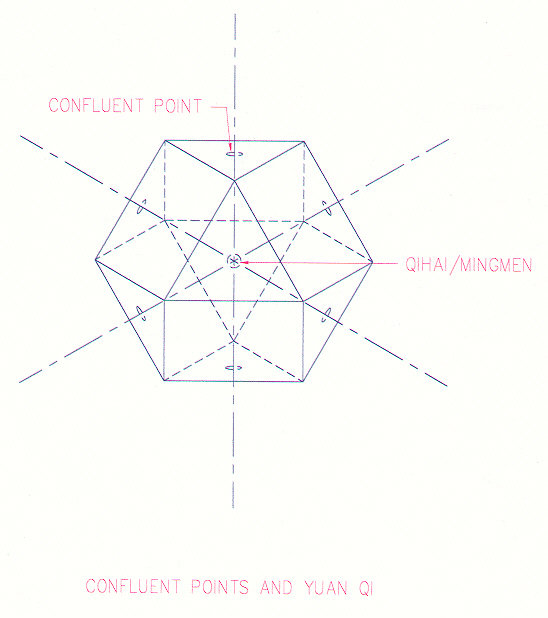 The centroid of the sphere represents the first ghost point, renzhong (man's center). The radius of a closest-packed sphere is equal to the distance from the VE centroid to the centroid of any local tetrahedron. 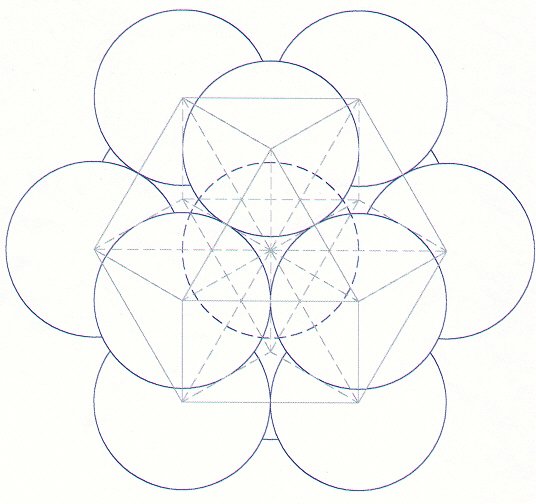 The Star Tetrahedron within the centroid sphere is an inner Flower of Life (merkaba). The geometry of VE superimposes perfectly on the Tree of Life which traces the path of spiritual alchemy.